With her timeless lines, her repowered main engines and replacement of her generators in 2011 this yacht performs Excellent. She sleeps comfortably 6 guests in 3 large cabins. Her Master stateroom has a California King bed with his and hers separate bathrooms.Her cruising is 17 knots @ 1950 RPM and 65% Load and a fuel consumption of 95 Gallons per hr on both engines with her Maximum speed: 22knots @2300 RPM. Other MAJOR REFITS where in 2007, 2010/11 (Year of Repowering and at the same time the yacht replaced the shaft logs and had a complete Paintjob) and 2016 took place at Rolly Marine Services. Zantino III is a 2007/2010/2016 and 2018 refited yacht. The most extensive refit (10 months at the yard) in 2010 was performed by Rolly Marine Services, in Fort Lauderdale and vessel management was consulted for major items for the refit by Patton Marine. Only two owners since new. The current owner purchased her in 1997. Replacement of both shaft logs (tunnels). Complete stabilizers service and rebuild as necessary. Complete rebuild in all of her hydraulics. Replacing of Large Mirrors at Port and Stbd guest Cabins. The electrical system has been also refited completely by a Marine automation and electrical engineering company. Mechanical repairs included replacing or reconditioning of all pumps, bilge pumps. 8 Delta T Systems fans in engine room and generator room in 2006. New Groundfos water pumps with water filters assemply. Recondition of Crew quarters with new carpets and wall papers. Port generator new (John Deere) in 2005. New teak decks throughout 2007. The tender was replaced with 18 feet Tender Novurania. Vessel had all running gear aligned and replaced everything necessary to assure vibration free cruising at Rolly Marine. New antifouling paint. Recently survey for owners and insurance purposes was perfomed by Lloyd's authorized surveyor. The vessel is very spacious for her size. 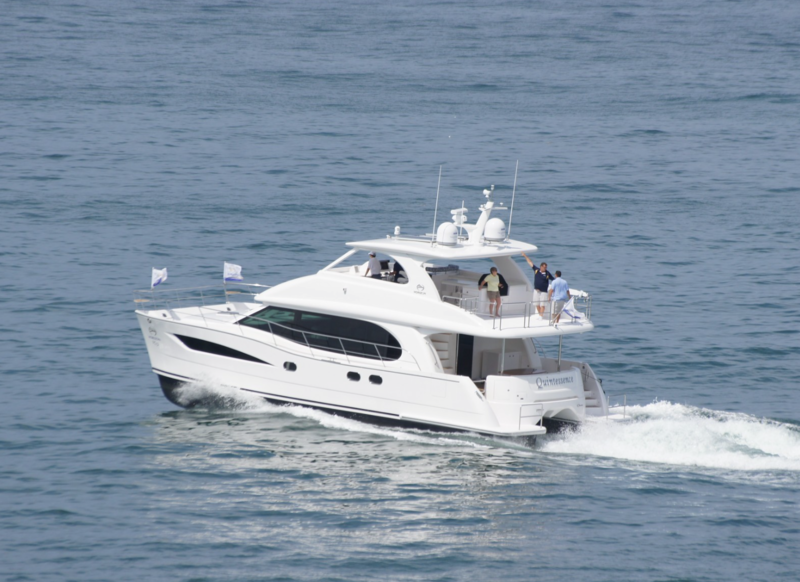 Entering from either the port or stbd side, you have the pilothouse forward and the two main salons aft. The aft salon has access to the side decks from two watertight doors to port and stbd. Continuing aft is the exterior aft deck. Via a spiral staircase located port side aft you can access the machinery/generator room and swim platform. Access to the generator and machinery room with actual emergency steering and AC units, is via a custom made watertight door with a view glass. Aft of the generator room is another watertight door from solid aluminum that gives you access to the swim platform. Moving back into the forward salon is a wide spiral staircase on the stbd side, leading to the three staterooms. Walking forward there is a Powder room with toilet and the pilothouse, which leads to the Flybridge. Continuing forward is the formal dining for 6 to 8 persons with a high gloss mahogany table, and custom cabinetry for storage of silverware, china and crystal settings. Via a swinging door, you enter the Galley and can continue forward to the crew quarters and Engine room. Zantino III has three (3) spacious staterooms, each with an en suite bathroom. These staterooms offer sleeping arrangements for 6 with a King berth, queen berth and twin berths. The teak aft deck has space for a large dining table and plenty of seating. The Caprail, which defines the space, is a high gloss varnished teak. The salon has a split configuration with the aft salon becoming private immediately with two doors. Two attractive couches in bright colors that foldout for additional overnight accommodations. Other features include an entertainment center, alternative seating spaces, Venetian blinds and decorative tables and home ware, as well as a small table with 4 upholstered parsons chairs appropriate for a card game or just a friendly gathering. The forward salon is a meeting and welcome area. Is also used as an office for the owners. The Formal dining area is forward the pilothouse and aft of the galley. A Mahogany high gloss table with brightly upholstered parson’s chairs seats 6-8 people. Custom cabinetry to stbd has an eye-catching granite top with 4 swinging cylindrical cabinets made out of stainless steel, as a base. Dining is this area can be as private as you and your guest would prefer. 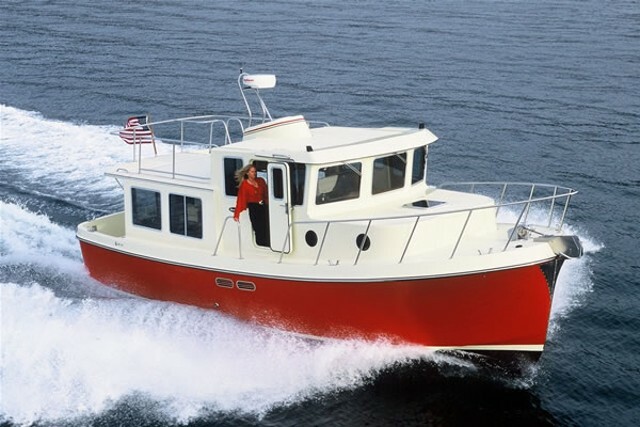 The electronics have been upgraded throughout the years; the most recent improvement is the installation of Satellite TV, Flat panel TV's throughout the vessel, wifi system, pilot house computer/plotter, etc. A complete alarm light panel with tank gauges for fuel, water and black water tanks is also found here. Other equipment includes Naiad stabilizer controls at both upper and lower stations, bow thruster controls, light switches and electrical panels. 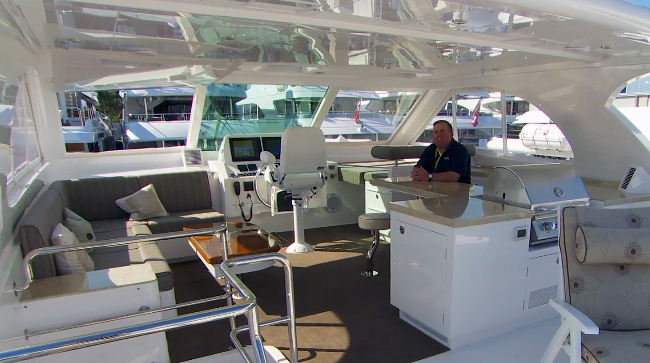 Under the helm station in the pilothouse is a large storage area with electronic equipment. Equipment in the galley includes: New Sub Zero Double door stainless steel oversized combination refrigerator and freezer 2005, new dishwasher (2011), two additional smaller refrigerators, (2007) a separate icemaker (2005), microwave oven, New Jenn-Aire convection oven(2007), Jenn Aire extraction fan (2005), and a trash compactor. 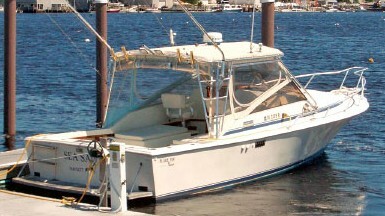 The fly bridge is a large area for entertainment with comfortable seating. Located at the center mast is a storage compartment and refrigerator. Navigation is simplified with two captain’s chairs found at the helm. Aft of the seating area is the center storage for the Tender and chocks for double Jetskis. Outboard port and stbd of the Toys area are the two heavy duty hydraulic Cranes. The master stateroom is extra spacious with King size bed and plenty of living space. There are his and her heads aft and to port and starboard. The stateroom can be easily split in two masters with each one having its own en suite bathroom. The nicely appointed VIP has a queen size bed with an en suite bathroom for privacy and convenience. This stateroom has a warm glow that is very inviting. The guest stateroom is located to starboard, and is the perfect spot for additional guests or kids with comfortable twin beds, all the comforts of home, and even an en suite bathroom. New custom made mattresses for all four beds were fabricated in April 2007. This was one of the first steps of an entire remodeling project of the crew quarters.This remodeling includes new carpet throughout, wallpaper and various carpentry repairs as well. This space is found via a staircase from the crew dinette and laundry area. Forward is the Captain’s cabin with an oversized bed, en suite toilet and shower, and one extra bunk. Sleeping arrangements are for at least two crew within the Captain’s cabin. Just aft of the staircase there is another Toilet/shower and the oversized door of the second crew cabin, with sleeping arrangements for two more crewmembers. TV's in each stateroom. Heavy-duty double anchor windlass by Ideal powered by A/C voltage with frequency drive, (upgraded from original) with center capstan for mooring and towing. Stockle anchors with in hull anchor guides and 300 feet of anchor chains. 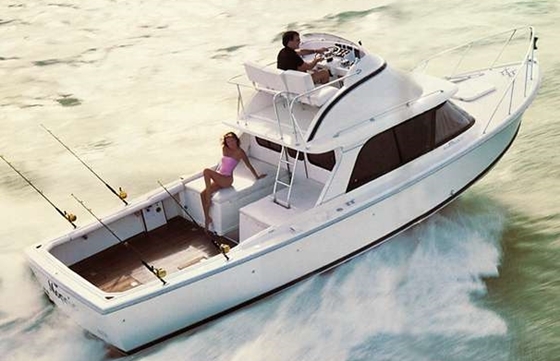 Foredeck guest seating includes comfortable seating and two sun beds one in each side of the bow. Aft of the crew quarters is the engine room. Stabilizer PTO pumps in each engine. Intakes of Enging room, on main deck. 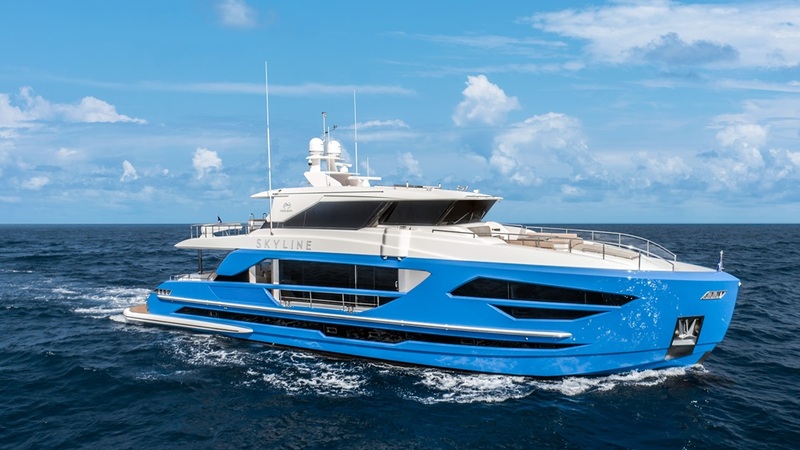 From the aft deck and a special fabricated hatch you have access to a wide spiral staircase leading to the watertight door that seals the generator room. Entering and moving forward you will find two new A/C Chillers. Forward and to port you will find the two brand new self-prime water pumps with expansion tanks within the pumps. Also to port side is the John Deere genset with soft soundproof pads, the double raw water pumps and the 40gph watermaker. Custom made emergency steering also located in the center of the compartment - easily accessible. Stbd side fwd is one of the water heaters. The Northern lights 80kw generator with the bow thruster PTO pump is at the stbd side. In the same area are the main power units for capstans, davits and two electrical panels. Generator batteries and service batteries also located in this area.